If Scott Masson, front man of Chicago indie pop favorites Office needed to further prove he had no desire to be involved in the "business" part of the music business (the band recently opted out of life on a record label after a brief stint on Scratchie/New Line Records that produced 2007's "A Night at the Ritz"), he's done just that by giving away their new record, "Mecca," as a free download. Having developed a devoted fan base since starting to release music under the Office moniker in 2000, Masson and company could have easily charged for the album, which is full of the catchy new wave-inspired hooks, top-notch melodies and clever lyrics listeners have come to expect. I am uncertain about the exact circumstances that led to it being offered for free, or even about the current condition of the band, but I am certain that "Mecca" is a damn good record. 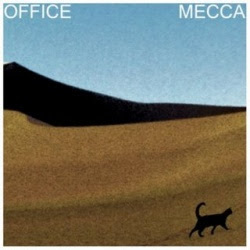 While "Mecca," Office's fifth released LP (a sixth album, "Glass Corvette," was recorded in 2004, but never released), continues the group's formula of addictive, jubilant pop set against mostly frustrated, often bizarre lyrics, it trades in the slick production of "A Night at the Ritz" for the less polished sound of previous records. In fact, the band was reportedly largely dissatisfied with the production of "Ritz," considering "Mecca" the true follow-up to 2005's "Q&A." Still, their sound remains the same at the core, evidenced by the record's jerky, singalong opener, "Sticky Dew," which sets the tone with a vibe similar to "Ritz's" opener, "Oh My," The track stands out as one of the record's most accessible, joined by the chimey, melodic bliss of "Enter Me, Exit You," the rocking sugar rush of "Dr. Drako" and the jangly "Double Penetrate the Market." Even when the band is less upbeat, as on "Trainwreck DJs" and closer "The Silent Parade," Masson's lyrics prevent the material from losing any of its strange charm, as evidenced by lines such as "Two-headed puppies race/If you've got a buck to waste/The helicopters above us already know us/El Chupacabra and Britney have joined us." According to Masson's Office blog, he is currently based in Michigan, while his bandmates have a new group and will soon play shows around the city. Hopefully this doesn't mean the end of the Windy City's claim to Office. If so, we'll be without one of the finest bands the city has produced in recent years, a distinction "Mecca" makes even clearer. yeah, that would be a shame to lose the rights to call Office a chicago band, but i'm sure they'll never forget their roots. I've some great times at their shows. and Ritz was one of my favorites of 2007, i'll back to you about Mecca.